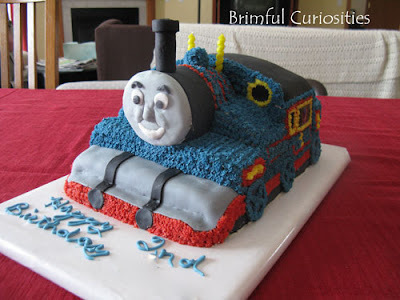 Grandma made the little guy a Thomas birthday cake. He LOVED it! Cake Boss couldn't have done a better job! Thanks, Grandma! That. Is. Awesome. My boys would have loved that when they were younger! Was this your mom or MIL? Whichever, they rock!! That is an AWESOME cake! Wow! Way to go Gramma!!! BIG GOLD STAR for her, that's absolutely great! I should be so talented. My grandson's would love such a terrific cake. They love Thomas the Train. Kudos Gramma! Happy WW! OH WOW! THAT TAKES SKILLS! VERY AWESOME!!!! that is amazing! totally beats my lame cupcakes for bdays. Okay....O.M.G.! That is fantastic! I wish I could do a cake like that. It's a wonderful photo too! What a cool cake! WOW! Wow. What a great cake! My nephew would love that. Grandma is very talented! I had one student's Mom bake me a birthday cake and when she brought it in, I thought it was a present because it looked so real. I love this one! What a great grandma! So cool. Grandma is very talented!! so cute. What a beautiful cake! I hope he had a wonderful birthday! Wow, she did a wonderful job!